Creative Specialties is a CNC Shop located in Southwest Missouri specializing in Milling and Turning featuring an arsenal of precision equipment to tackle the high volume of metal cutting demands of today's market. Live tooling, quick-change fixtures and 3D Cad/Cam capabilities help give us the reputation of quick turn precision machining in the greater Springfield area. We offer custom manufacturing for all clients. Our ISO 9001:2008 Registered manufacturing division can create virtually anything that needs to be cut, machined, threaded, milled or otherwise manipulated-quickly making the unavailable parts...available. We can manufacture OEM or custom in all grades of material including carbon and stainless steel, aluminum, bronze, brass, titanium, and duplex materials. Furthermore, we also work with composite materials such as teflon, delrin, nylon, peek and others. Industries served include aircraft, packaging, petroleum, automotive, filling, pharmaceutical, energy and agriculture. Assemblies, tooling, fixturing, castings and forgings. Up to 4 axis Milling and 3 axis Turning including assemblies, tooling, ect. There is no compromise in quality for our customers from start to finish with our ISO registered quality process. With our low overhead and innovative nature, you will find our pricing to be competitive. Every effort is made for your delivery to be prompt, usually within our customers' lead time. Our experienced staff is committed to maintaining our standard of excellence in manufacturing support and service. High quality components are manufactured per exact specifications, in a timely manner, at competitive prices. All jobs, big or small, are manufactured with precise dimensional accuracy in accordance with strict specifications. From machining castings and components to full assemblies, we can provide a “turn-key” solution at an exceptional value. Our mission is to provide cutting edge possibilities through precision machining, while maintaining the strictest quality standards available for our valued customers. 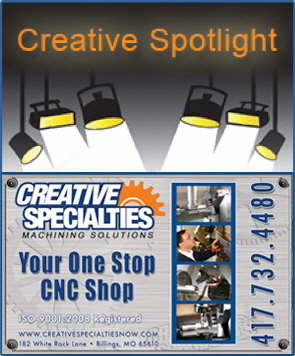 At Creative Specialties, you get your parts done on time, and get them done right! Our Customers are #1. If we don't take care of you, someone else will. Copyright © 2013 Creative Specialties, LLC, All Rights Reserved.